Again, both recipes can be made with leftover vegetables and rice. If I have more time, I would make my own burger buns too. :) These burgers are great and fun to make with kids. I usually make Saturday as my burger day because I am given more time to prepare in the kitchen. With the extra patties, I just store them in the freezer for later use. Having those pre-made patties definitely help save a lot of time during the week for a quick meal. 1) Preheat a frying pan with a drizzle of olive oil on medium low heat, caramelized the capsicum and onion in 5-10 minutes. Season. Set aside. 2) Preheat a frying pan with a little olive oil on medium low heat, cook carrots and corns for 2-3 minutes. Season. Set aside. 3) To make the patties, mix the cooked brown rice, mashed chickpeas, grated cheeses, chopped onion, garlic, parsley, carrots, and corns. Add eggs and breadcrumbs. Season. Mix well and use the hands to form each 3cm thick sized patties. 5) Place the cooked patties on a kitchen towel to soak up any excess oil. 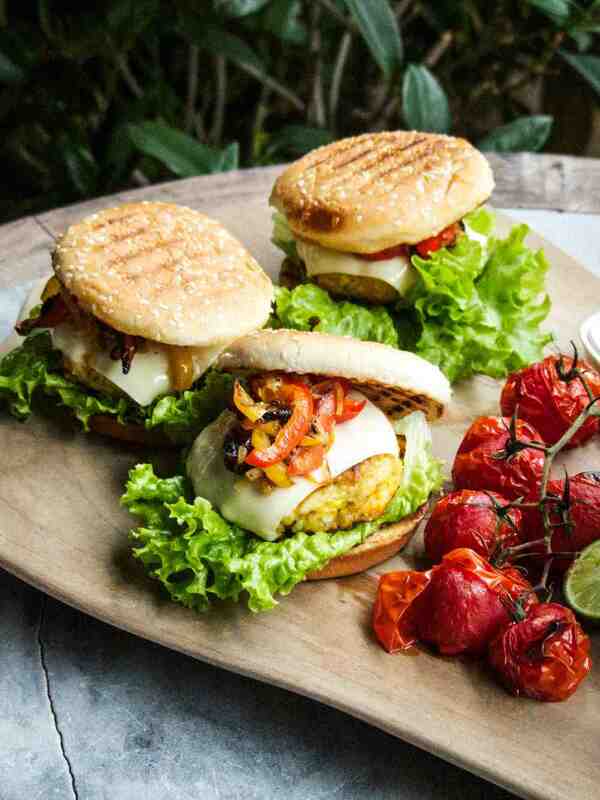 Stack each burger with grilled mozzarella, fresh lettuce, caramelized capsicum and onion PLUS some fresh lime zest aioli and a dash of hot sauce. 1) Preheat a frying pan with a drizzle of olive oil on medium low heat, caramelized the onion in 5-10 minutes. Season. Set aside. 2) Preheat a frying pan with a little olive oil on medium low heat, cook carrots and baby corns for 2-3 minutes. Season. Set aside. 3) To make the patties, mix the cooked white rice, mashed chickpeas, chopped garlic, spring onion, carrots, and baby corns. Add egg, sesame seeds, and breadcrumbs. Season. Mix well and use the hands to form each 3cm thick sized patties. 5) Place the cooked patties on a kitchen towel to soak up any excess oil. Stack each burger with fresh lettuce, caramelized onion, teriyaki sauce, lime zest aioli , and mustard.